The Painful Memories DLC pack will add new maps, guns and more to Max Payne 3. The Max Payne 3 multiplayer cavalcade of fun continues next month with Painful Memories, a multiplayer add-on featuring four new maps including the "Roscoe Street Subway," the underground station from the original Max Payne where Alex Balder met his end. There's also "Marty's Bar," the skeevy dump where Max and Raul Passos first met, "Shoot First," set aboard the enormous Branco family yacht, and the wide-open "Canal De PanamÃ¡." Also on tap on the UAR-21 and IMG 5.56 assault rifles, new avatars and items, and the appropriately substance-abuse-themed Hangover Burst, which causes enemies to respawn with blurred vision and reduced stamina and health. Apparently only Max gets better after a bender. Is anybody still playing Max Payne 3 multiplayer? Not that I begrudge online gamers their fun, but the strength of the series has been in its single-player component and I'm starting to wonder what a guy has to do to get some solo DLC action going on. Max isn't dead, after all, and as the Max Payne 3 flashback segments demonstrated, he had plenty of adventures prior to all that unpleasantness in Sao Paulo. Why not throw the man himself into the breach once more? 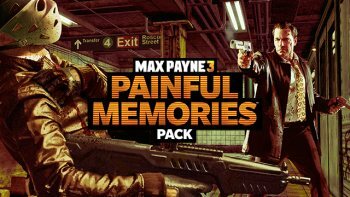 In any event, the Max Payne 3 Painful Memories pack will sell for 800 Microsoft points on the Xbox 360 or $9.99 on the PlayStation 3 and PC, unless you're a Rockstar Pass owner, in which case you'll get it free, and comes out on December 4.